For comments or questions about this site, please use the Contact Form. 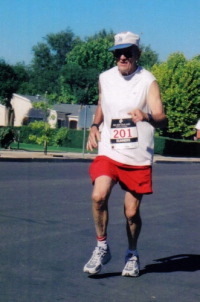 The High Desert Runners club is an association of runners from the Antelope Valley and surrounding areas dedicated to distance running for athletic competition and life-long health benefits. Founded in 1978, the club includes members of all abilities from occasional joggers to elite middle- and long-distance runners, and ranging in age from pre-schoolers to seniors in their 80’s. Included among our activities are interval and speed track workouts, weekend fun/training runs, administration of and participation in public road races, monthly mountain trail runs and sponsorship of an annual summer cross-country series. We hold an annual awards dinner each winter. We also publish the HDR Express newsletter that is e-mailed to our members to keep them informed of club activities, upcoming events, race results and other items of interest. More information is on our Facebook page. The High Desert Runners is incorporated as a non-profit educational and cultural community organization under the laws of the State of California. We are governed by an elected board and officers, who are elected at our annual awards dinner. We are an affiliate of the Road Runners Club of America. Our annual membership fee, renewable on Jan. 1 each year, entitles you to participate in all club activities, receive the club e-newsletter, and receive discounts at club-sponsored events for which a fee is charged. Our current fees are $15 (individual), $25 (couple/family at same address), and $7.50 (full-time student). On-line application is available HERE.